Posted on 18, January 2016 by EuropaWire PR Editors | This entry was posted in Education, Environment, Science, Sweden and tagged arctic soil, greenhouse gas carbon dioxide, Marina Becher, soil frost, Umeå University. Bookmark the permalink. Umeå, Sweden, 18-Jan-2016 — /EuropaWire/ — Soil in the Arctic has for thousands of years gathered large quantities of decomposed organic matter due to the decomposition being slow at the low temperatures in the region. As temperatures in the Arctic are increasing, there is a growing concern that the organic matter stored in the ground will be decomposed and released as carbon dioxide. Such a process would contribute to the ongoing increase in this greenhouse gas in the atmosphere. So far, predictions of future carbon dioxide emission from arctic soil have not taken into account how soil frost processes affect greenhouse gas emissions. Marina Becher at the Department of Ecology and Environmental Science shows in her dissertation that temperature is not the only important factor for the amount of greenhouse gas being released from the soil. She provides results that imply that the release of carbon dioxide will also be affected by the changes in soil frost processes. An intriguing result of Becher’s studies is that soil affected by severer soil frost seems to be acting as a significant source of carbon dioxide in the Swedish mountains. “I measured the fluxes of carbon dioxide for one year in fifteen various sites in the mountainous area of Abisko in northern Sweden. I found that all these locations released more carbon dioxide than what could be taken up and stored in local plants” says Marina Becher. The fact that soil exposed to severe soil frost processes is a source for carbon dioxide deviates from the common notion that arctic soil is still binding more carbon dioxide than it releases. This is a result that shows that soils subjected to severe soil frost may behave differently than soil less affected by this process. Marina Becher shows in her dissertation dissertation that soil frost affects both the plant species composition and how effective plants absorb carbon dioxide from the atmosphere through photosynthesis. Heavy frost heave makes it difficult for plants to photosynthesise as their roots may break when the ground moves in winter. Soil frost processes also control where in the soil organic matter ends up, which is of great importance to the speed of decomposition. “If soil frost processes cause an upward transport of old plant matter to the surface by frost, it can increase the release of carbon dioxide,” says Marina Becher. Marina Becher’s studies indicate that old organic matter that was buried in the little ice-age (a period of cold climate that ended about 100 years ago), may have been transported to the soil surface during the last decades and decomposition of this carbon could be an explanation for the net release of carbon dioxide from the soil. In order to study how soil frost processes affect carbon storage in the soil, Marina Becher has used and studied the patterned ground phenomena caused by soil frost, called non-sorted circles. These are circle-like features of soil with limited vegetation that are surrounded by vegetation. These features form above the tree line in mountainous regions when the soil moves due to severe soil frost processes. “Before I started my doctoral studies, I had never taken any notice of these circles on my mountain hikes. Now when I look at old photos, I see that we have often pitched our tents on them as the ground tends to be more flat there. Nowadays, I see these features everywhere,” says Marina Becher. 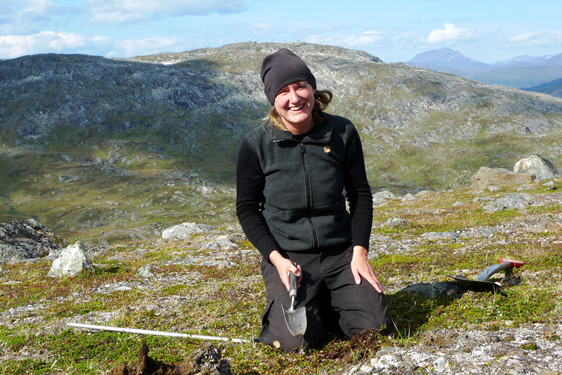 The studies performed by Marina Becher clearly show how important it is to understand how soil frost processes are affected by a changing climate if humans want to be able to predict the future release of greenhouse gas from the Arctic. On Friday 22 January, Marina Becher, Department of Ecology and Environmental Science at Umeå University, defends her dissertation entitled: Cryogenic soil processes in a changing climate. Faculty opponent: Professor Philip Wookey, Terrestrial Environmental Sciences, Heriot Watt University, Edinburgh, United Kingdom. The public defence of the dissertation takes place at 10:00 in Stora hörsalen in the KBC Building.